People will talk about walking in from Glencanisp lodge being the easiest and fastest way to access the mountain. Many will say it is more picturesque to walk in past the cascades at the falls of Inverkirkaig and a few have mentioned the through route from Elphin to Lochinver taking the old track past Suilven and Canisp. 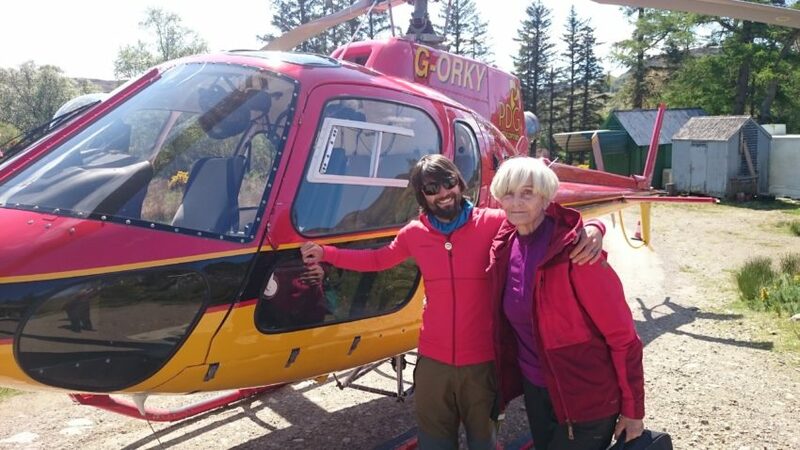 I would say by far the easiest way I have got up to the top this year was by helicopter while working for a filming project, keep your eyes peeled for a film called EDIE. After a late booking I was asked if I was available to be a mountain guide on the following day. Turning up at the specified time of 11:00 the next morning I was started to wonder what I had let myself in for as I watched about two dozen people buzzing around getting camera equipment into the right place. “The helicopter will be here at 11:15” someone said and I thought, what!? a helicopter…. Sheila Hancock is the lead actress and my job for the day was to look after her and make sure she stays safe on the hill. A very interesting day for me and certainly a fast way to get to the top of this amazing and iconic mountain. But if you, like me cannot afford to buy a quick helicopter taxi to the top then you might consider a more natural wilderness trip into the loch systems at the base of the mighty Suilven. Putting in at the lazy village of Elphin we made our way along Cam Loch and a wonderful camp site underneath the mighty Suilven. The next day we moved by way of portage and canoeing along to Fionn Loch and an easy access to Suilven for a late afternoon ascent with none of the usual crowds. With only two days left we portaged into Loch Sionasgaig and made an ascent of Stac Pollaidh for the less than standard route.